Our School management system has following features. Please go through each for better understanding. Attendance is somewhat very detrimental for the student as well as for the institution to build up a good relationship. However it takes up much of the quality time for the teacher at the beginning and at the end of the month. We focused on that area by developing the system from scratch. The system detects the absentees and send messages to their parents by an automated sms system which responds as soon as the attendance is given. There’s a bulk sms installed within the system for attendance, marks delivery and important notices to be sent. This messages can be used to notify the teachers about anything and also to the guardians for any major inconvenience. Basically it’s an urgent medium for the institution to communicate with its stakeholders. In this module, institution can store their detailed information about their teachers and students. This part allows the authority to instantly access any information of their stakeholders for further uses. This is an extended part of SMS services. All the details of the databases are linked with institution’s email for swift uses of mailing. Anyone can sent mail to a designated mail address of any institution and the recipient UI is designed in such a way so that all the mails can be answered swiftly and efficiently. This is a very important part of our system. This part allows the teachers and the authority to take the average of attendance, marks in instance. Our attendance module automatically generates reports of any students and this reports are ready to print at any moment. This process also applies when calculating marks in semi-annually or annual basis. In this part any teacher can give input of the marks of any students and ask the system to find the average of any percentages. This module is also linked with the bulk sms module for notifying the guardians. All the exams and quiz marks can be stored swiftly and efficiently in the database and can be asked the system for an automated report. We believe this is the era of smart gadgets and thus we developed software for android and ios devices for remotely control the system. Teachers can log in to the system remotely using their mobile apps to change or give input. This system also incorporates the parents to check their students’ marks and reports as well as the attendance. If any institution wants more automation, then we are providing rfid tags and detectors with the system. This allows the system to detect and identify the students as well as put the attendance automatically. In this process the sensor is ranged 20-60 ft from the classroom and whenever a student walked in the classroom, his/her attendance is taken automatically by the system. This saves a lot of time for the teachers. The RFID tag is unique and embedded in every students ID card. If the institution wants to track the attendance of it’s employees, then they can do it easily with this system. This module allows the teachers to file any complain to the HR department or the respective authority. Since we have the mobile software is ready, teachers can communicate with the institution much efficiently and easily. This module allows the institution to create a safe ID and passwords for the users and in this case for the teachers and guardians. Whenever any input is given the system automatically generates passwords for the students or the teachers and send it their number or email. They can use this id and password to safely log in to the system. This module allows the authority to efficiently distribute the seats. They can set the terms in their system and the system can automatically sort the deserved people for their hostel seats. Also guardians can look for the rules and whether or not any seat is vacant for occupying. This module allows the authority to allocate students into the transports system. Also if there’s any changes, they can do it through this module. 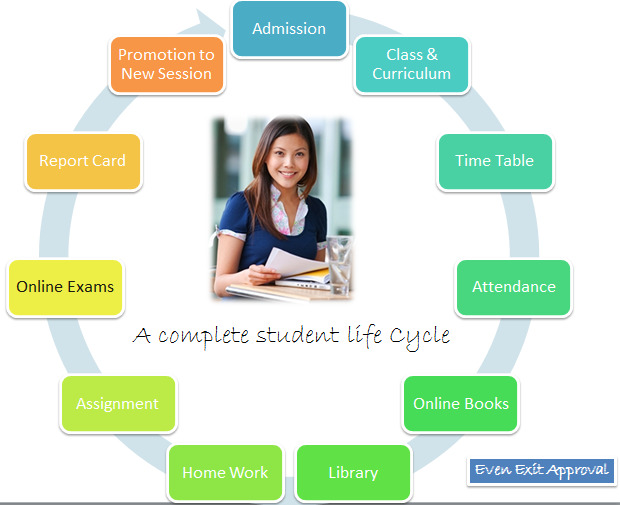 This online dashboard can be used to notify the teachers as well as the students. If there’s any new notice, the user can sent that to every students or teachers or individually to someone. Also the app users will get a push notifications in this case. School Management Software (SMS) is a system, designed to cut down the time of taking attendance and calculating marks to increase the efficiency of the teacher as well as making sure of two way communications between the institution and the respective guardians. This system is designed to ensure the attendance is properly monitored by the institution by a complete automation system which can be equipped with RFID tag or can be controlled by a Smartphone or Tab.